Enjoy all the protection of wearing socks without the look by pulling on a pair of Pringle shoes liners from this 3 pair pack. 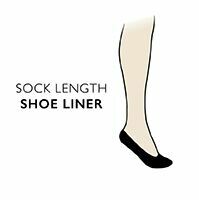 Shoe liners have been designed to cleverly fit under your shoes so they can’t been seen but offer lots of protection in the important areas. In a cool fine mesh, these Pringle no show liners will let your feet breath and stay fresh. The non cushioned feature will ensure a lightweight, non bulky, sleek fit that is full of comfort.